The SAM DA1 ARM® Cortex®-M0+ -based microcontrollers are operating at 48MHz (45DMIPS). 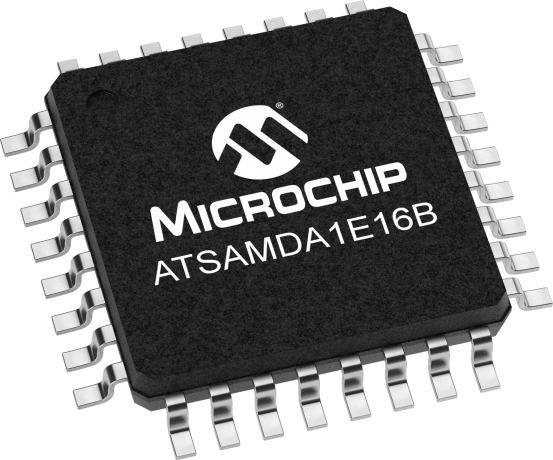 The ATSAMDA1E16B provides 64KB Flash, 8kB SRAM and 2KB RWW Flash. The peripheral set for connectivity consists of 4 serial communication modules (SERCOM) that each can be configured to act as a USART, UART, SPI and I2C. Additional connectivity options are provided by the on-chip one channel Inter-IC sound interface (I2S) and the full-speed USB 2.0 embedded host and device. The ATSAMDA1 family is AEC-Q100 Grade 2 qualified. The standard device does not go through the automotive production flow, and there are two options for ordering devices with the automotive production flow. 1) A customer specific part number will be assigned and designated with suffix to the base part number (i.e. ATSAMDA1E16B-MBTV02.) A customer specific PPAP is available on request. 2) A generic suffix will be added to the base part number (i.e. ATSAMDA1E16B-MBTVA0.) A PPAP is unavailable for these devices.